When you think grand luxury vehicles, several carmakers come to mind, but the real champion of its class has always remained Rolls-Royce. The British auto staple knows all about building a high-end vehicle that embodies power and performance, while maintaining an affluent presence only the lavish of most lavish could embrace. 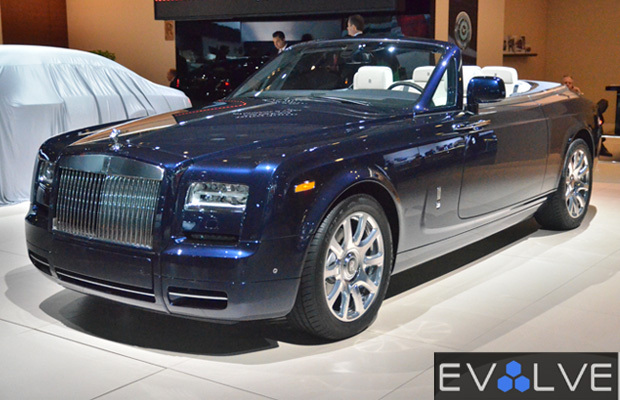 Stepping into the 2014 NY Auto Show, the company brought over its popular Phantom Drophead Coupe—a classic V12-powered convertible bearing the brand’s iconic grille and spirit of ecstasy bonnet symbol, along with some innovative interior design and bespoke elements that make it such a gorgeous piece of auto machinery. Once again, President of Rolls-Royce Motor Cars North America, Eric C. Shepherd, gave us the grand tour of the Phantom Drophead Coupe from the inside and out, even showing us the infamous built-in umbrella mechanism located on the side of front door. C’mon, you know we had to get a close-up of that for kicks. Take a look at the primetime vehicle below.